Mobility aids are essential to the quality of life for many individuals. Without such a device, many people would be unable to move freely about their own home, much less go anywhere outside of their home. For decades, the walker has been a go-to mobility aid for senior citizens. And while these devices are certainly useful, they’re quickly being replaced by a more advanced version known as the rollator walker. Here are 5 key benefits that the rollator walker provides over a standard walker, and why you should consider using one of these mobility aids. The most obvious perk of the rollator is that it has wheels on the end of each leg. 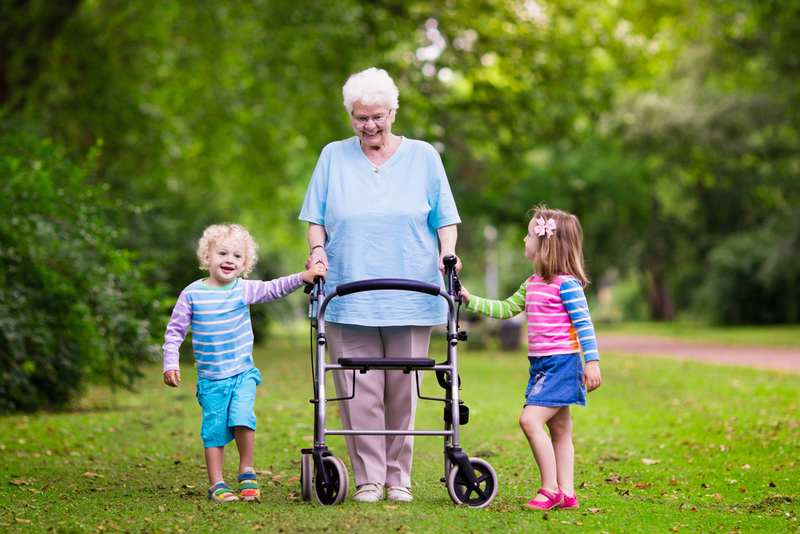 This means that you will be able to move the walker along more smoothly, rather than having to steady yourself enough to be able to lift the walker and set it ahead of you every few steps. For some individuals, standing without support for even that short amount of time—and trying to lift and move an object while doing it—can be extremely difficult. The wheels on a rollator walker eliminate the need for this motion, making it easier to use, especially for those with more limited strength and mobility. If you’re worried about your rollator rolling away from you on those wheels, don’t worry. All rollator walkers have built-in brake handles. A simple squeeze will apply the brakes so that you don’t have to worry about your walker getting away from you on hills and slopes. Most standard walkers are built solely for walking, and don’t address a very important issue—many individuals who need to use a walker also need to rest periodically. If you’re using a standard walker, and you find yourself in need of a break, you’ll have to track down a place to sit. Rollators, on the other hand, typically have a built-in seat between the bars of the walker. This makes it easy for users to put on the brakes, then simply turn around and sit down, right on their walker. Having this feature available to you is incredibly convenient; and, for some people, it is vital to their health and well-being. The sizes of standard walkers don’t tend to vary much, and, though most are relatively lightweight, they can be wide and difficult to maneuver in small spaces. Rollator walkers come in a variety of sizes, weights, and styles, so that you can find one to fit your needs. For starters, there are lightweight models that are 11 pounds, as opposed to the standard 15 pounds of your normal rollator walker. Those few pounds can make a big difference for someone with limited mobility and strength. Additionally, if you have issues maneuvering your standard walker in your home, a three-wheel rollator walker could help with that. These walkers are lighter, narrower, and shaped similarly to a tricycle. The single front wheel helps the walker to make tighter turns, so it is more maneuverable in tight spaces. Your basic walker isn’t designed for use on anything but a level surface. However, there are rollators that are designed to function both in your home and outdoors. The gripping casters and wider tires make it easier for the rollator to move along uneven walking trails and dirt paths, so you can enjoy a stroll in the park with your family. Tired of putting tennis balls on the ends of your walker to keep it from marking up your home’s floors? The rollator walker is equipped with non-marring tires, so they won’t scuff up the floors, making them the ideal mobility solution for both outdoor walking and indoor mobility. Now that you understand the benefits of a rollator walker over a standard one, it’s time to address the difference in price. Yes, it’s true that a rollator will typically have a slightly higher price tag than a standard walker. However, the price difference is usually only about $50, and considering all of the important mobility and quality-of-life benefits that a rollator can provide you or your loved one, that price difference is minimal. If you’re looking for a new mobility aid, we strongly recommend stopping by one of our many Texas locations to take a look at the rollator walkers for yourself. Speak to one of our associates about the different models we have available, and the difference in price between the rollator and a standard walker. We will be happy to assist you with choosing the best mobility device for your budget and lifestyle!